Control the smart products in your home easily and securely using your iPhone, iPad, Apple Watch, HomePod, and Mac. 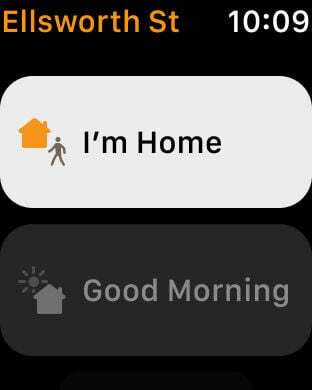 • Control each of your HomeKit-enabled accessories individually, or group them into scenes so they work together with a single command. ◦ Supported accessories include lights, thermostats, door locks, window coverings, garage door openers, video cameras and doorbells, sensors, and more. • Add HomePod or other AirPlay 2–enabled speakers to the Home app to play music in any room in your house — all at the same time. • Have Siri help around the house. Ask Siri to “Lock the front door” or “Play jazz in the living room,” or say “Good night” to turn off all your lights. • Quickly access and control your favorite scenes and accessories in Control Center. • Receive notifications and keep aware of important events in your home as they happen. • Choose to share control of your home with others using their iOS devices. ◦ Access and control everything while away from home. ◦ Automatically run scenes and control accessories based on your location, the time of day, a sensor detection, or the action of an accessory. * Fourth-generation Apple TV or later.